Finally coming up for air after a hectic Spring that included a hugely successful Catharsis West Coast Tour, a performance at the beautiful NYC venue, SubCulture, as part of Greenleaf Music’s 10th Anniversary (read the NY Times review of that performance! ), a very memorable gig with the Big Band Living Legacy Project at the Kaye Playhouse which was recently written about by Tak Tokiwa in Japan’s leading jazz magainze, Jazz Life, and a multitude of fun gigs with some of my favorite composers and band leaders including Pedro Giraudo at the Jazz Standard, Maria Schneider at Birdland, Samuel Torres, Ari Hoenig, Emilio Solla, et. al. (don’t forget to check out the amazing new records by Pedro, Maria, and Samuel!!!). In other news, Catharsis is scheduled to record our next record on October 28th and 29th with a very special guest (TBA). We have some exciting gigs this Summer and Fall as we gear up for the record date including our first appearance at Jazz at Lincoln Center’s Dizzy’s Club (August 3rd), two nights at Cornelia St. Cafe (Sep. 26th and 27th), and Barbes Brooklyn (Oct. 27th). I’ll be writing more about the concept and compositional process behind this next record later on this summer but I am already SUPER excited to share this new music with you all! 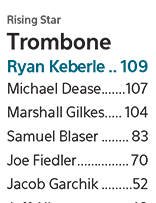 Finally, I was equally honored and surprised to be listed as the #1 Rising Star Trombonist in this month’s Downbeat Critics Poll. I’m surrounded by friends, colleagues, and inspiring trombonists.